And for me it isn’t about the New York Knicks or the NBA. I stopped watching NBA when Jordan, Pippen and Rodman disbanded, and Penny Hardaway stopped playing for Orlando. (Meh, that just made me feel old.) I never rooted for any NBA team since. But Jeremy Lin happened and I find myself watching NBA replays and post-game interviews again. 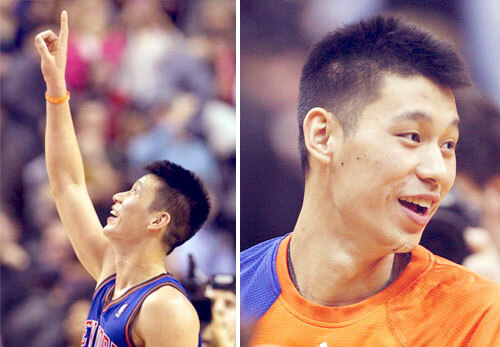 And since that’s not enough to feed my curiosity, I start digging into non-sports articles and videos about Lin from his pre-basketball stardom too. The more I dig in, the more in awe I am of his story and its impact that’s so huge even non-basketball fans like me would start watching basketball again; more so, how backsliding Christians would start coming back to faith (true story) inspired by him. On a lighter note, I think my husband is happier because now he gets to watch basketball games AND spend time with me at the same time. You’re welcome, dear. + You’ve probably seen him give tips on how to get to Harvard, but you should see his cameo in this Kevjumba video! My churchmates and I LOL-ed over these vids. My favorite part was when Jeremy was caught on video holding an iron, in bed! + In an InterVarsity interview, back in his college years, Jeremy answered questions about how his faith kept him grounded. It’s inspiring to see how solid his Christian disciplines are. + Jessie Eissenberg shares awesome stories about how Jeremy helped him through tough times; and how he offered to donate a kidney to someone he’s never even met. + John Piper quotes him. He says Jeremy seems to have his head on straight—and coming from The John Piper, that’s saying a lot. Some says Linsanity is just a fad, some says it’s magic. I say it’s a story of faith, how God’s work is not confined within the four corners of the church, but goes on wherever He places His people. You see, I believe in a God who builds up not just small and ordinary people but successful and influential people as well; and He uses them to bring His message to a world that has somewhat stopped believing. This God we live for? He’s very strategic. Knicks is losing to the Nets as I blog this, but this Linsanity has stopped being just about basketball and winning games for me now, and maybe for some of you too. For the first time in my life, I watch NBA and see God at work there.